Kyle Hartzell of BowlerX and Eric Filipovits test the Roto Grip Critical Theory. The testing was performed on a medium house tapered shot. Kyle launches the ball just over 17 mph and the ball enters the pocket at 16 mph. He’s targeting 19 out to about 8 at the breakpoint of about 42 ft. Kyle is able to generate pretty close to a ridiculous 8 degrees of entry angle! During the same session, he also got 8 degrees of entry angle with the Storm Marvel Pearl, but these 2 balls go about this differently. The Critical Theory is super strong at the breakpoint. This ball is much more skid/flippy than the Marvel Pearl. In addition, it has more traction with it’s 4000 abralon pearl finish. This really is a very strong ball which can handle much more volume than the medium house shot we tested it on. 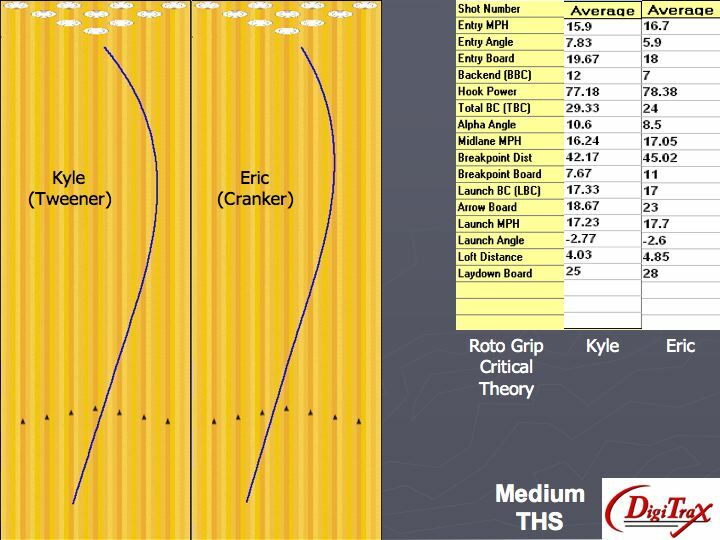 If you look at Eric’s track, you will see that he has to play this ball even deeper, 23 to 11 and still generates 6 degrees of entry angle. They both get about the same overall strength on this pattern. The Roto Grip Critical Theory is a very strong pearl reactive ball. It makes a very defined strong move at the breakpoint. The difference between this ball and many skid/flip balls is that despite the strong move, it is still very continuous. This ball can handle much more than Medium conditions and is simply too strong for anything less. I can see a lot of people wanting this ball motion but being unable to put it away at the right time. Use it at the right time and it will be fantastic. As the lanes breakdown, be prepared to drop to something with a little less bite. Don’t forget to check out the complete review and video of the Roto Grip Critical Theory. Previous PostStorm Marvel Pearl Bowling Ball Digitrax Analysis ReviewNext PostHow’s your season going so far?